The bigger sizes are also ideal for twintip riding no matter what your level. A "do it all" kite, that can be used for TT and Foil. 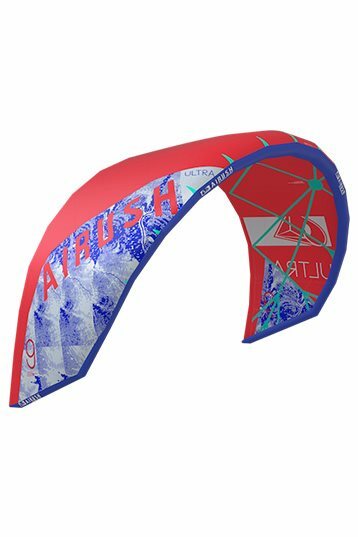 These kites (I have the 9 & 12) are incredibly good and ideal for TT and Foiling. I even sold my Ozone Edge 11m, the Ozone Edge 8m I still use for stronger winds on the TT. This type of kite will take over the market in the comming year (like the Alpha, Boxer and Mono). Excellent overall kite! Very light and stable. Perfect for foiling or surf riding. Actual decent for twin-tip and boosting. When overpowered or sheeted out you can feel the flutter (which I believe is a negative for this kite). I had a sweet session with really gusty conditions. Airush told me that are the conditions the Ultra is made for... and it is. For a tube kite it was super stable and it just kept on staying in the air. It was gusting everything from 0 to 12 kts and everything in between. Riding a hydrofoil and making a smooth turn the kite stayed controllable so good drift and steering with low line tension. Smooth turning and no surprising kick in the loop. if you are one of those lake hydrofoilers you should give it a try. Did you also tried the 12 Air Rush Ultra? I am looking for a Kite for foiling. I can not decide if I should buy size 12 or 15. I am 67 kg. Ultra 15 has verry good lowend and I think over 14 knots I will change to my other kite. But I think 15 will be much slower for the handling. Definitely get a 9m, 12 and 15 are too big for foiling, you will be overpowered in normal seabreeze (ie. gusts to 13knots). On the hydrofoil trying the new 9m Airush Ultra light. On the water where 15m foil kites one 11m tube (couldn't keep his hight on a surfboard) and I was the smallest with a 9m kite. This Ultra light has a really nice low end. Reacts fast, great drift and stability in these light winds. It feels a bit like the other single struts kites like the Naish Boxer & North Mono only lighter with more boost & lift. Nice Airush!